D-Day was the largest amphibous assault ever devised. 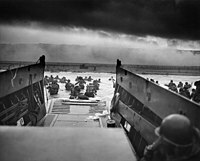 On the 6th of June 1944, the American, British and the Canadian forces stormed the beaches of Normandy. For events taking place on the 7th of June and afterwards, see Category:Battle of Normandy and its subcategories. For views of the landing sites today, see category:Battle of Normandy by location and its subcategories. For D-Day-related exhibits, see category:Battle of Normandy museums. This page was last edited on 13 June 2018, at 06:18.